The Rastafari movement is a monotheistic, Abrahamic, new religious movement that accepts Haile Selassie I, the former, and final, Emperor of Ethiopia, as the incarnation of God, called Jah or Jah Rastafari. Haile Selassie is also seen as part of the Holy Trinity. Other characteristics of Rastafari include the spiritual use of cannabis, rejection of western society (called "Babylon"), and various Afrocentric social and political aspirations, such as the teachings of Jamaican publicist, organizer, and black separatist Marcus Garvey (also often regarded as a prophet), whose political and cultural vision helped inspire Leonard Howell to develop the foundations of this world view. The Rastafari movement predominantly emerged in Jamaica in the 20th century, and it proclaims Africa (also "Zion") as the original place where the body of the first man was found, which established independency among blacks. The name Rastafari is a portmanteau of "Ras" (literally "Head," an Ethiopian title equivalent to Duke and which was the pre-regnal title of Haile Selassie), and the first name of Selassie's pre-regnal given name, Tafari Makonnen. The movement is commonly refered to as "Rastafarianism", but this term is considered derogatory and offensive by some Rastas. 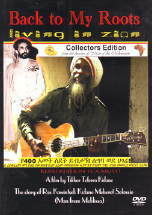 Find dvd's & movies about Rastas and Rastafrians.